Companies have incorporated it in their missions and visions to have the most difficult and mind boggling model code numbers for their laptops. They are generally eight to ten characters long, alpha- numeric, with mandatory special characters, and what not. Misplace one character, and you reach an entirely different laptop. Visited one shop previous month too in Nehru Place and that day every salesman was trying to sell a particular brand's laptop, going gaga over its features. This week, this brand's laptops were present in the back most display and we were transferred from one salesman to another for the same. And yes, this time a new brand was the store's favourite ... some loyalty. Try asking for the best price of a laptop (some major bargaining happens in this market), the salesman would do some quick calcualtions on the calculator with an extremely serious look, and would quote you a price with an additional warning - "Yeh price sirf aapke liye hai. Kisi aur shop mein mat batana, otherwise I wont be able to give you the laptop at this price". Almost felt like smacking the salesman. Who said travelling alone is boring? Till some time back, I was one of those people who was travelling almost every month. No, this was not corporate travel. On the contrary, my travel has almost come down to zero, since I entered the corporate life. I used to travel and that too a lot when I was in college. There would always be some or the other travel tickets in my wallet – either from the last travel, upcoming travel or travel details waiting to be converted into tickets. And these were travels which I used to look forward to – visit to home from hostel or back, visit to friends living in a nearby city or weekend trips with friends. Travel itself would also be of all kinds – 4-5 hour bus journeys, extremely long (more than 28 hours) train journeys, flight travels or a combination of these. Quite a good percentage of the travel journeys were alone. And since then, I have been a fan of travelling…. So, what’s so great about all this to and fro between cities. Just before you embark on a journey, life is extremely hectic. Well, it surely is for me. There are those more than hundred tasks which you have to finish before the journey – packing all your stuff very carefully, else be sure to miss out on that one thing which you just can’t do without, arranging food for the journey (ask any hostel student how important a task this is), ensuring your bookings are in place, and the list goes on and on. So, I am generally seen hopping around looking extremely busy just before a trip, hoping that the entire checklist of tasks would be completed successfully and everything would go perfectly. In spite of all the preparations you do, be assured that Mr. Murphy would surely strike. After I have fought Mr. Murphy and thanked God, the moment arrives. The moment you are seated in your mode of transport and everything from getting the seat to arranging the luggage has been taken care of. The moment when you take a deep breath and a sigh of relief comes out. This instance is like a moment of truth for me. This moment you realize that for some time (the duration of your journey) at least, you can just sit back, relax and comprehend the things around you. You can just sit and spend time with your own thoughts because pretty much that’s all you can do. Spend time watching people around you, and one realizes that there couldn’t be a better way to pass time. Read a book if you want to or don’t if you don’t want to. Call someone if you want to or don’t if you don’t want to – Use the age old excuse of no network during travel and no one will hold it against you for not calling ;). This is also probably the reason, that I don’t want phone and internet facilities to ever come to air travel because that will just push us to work on flight too and not experience these moments of truths. 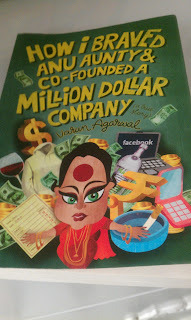 I recently read an interesting book (thanks to my cousin who gifted it to me) - "How I braved Anu aunty and co-founded a million dollar company". After a long time, I truly enjoyed a book from first page to last page and completed it in one day in one go. The book has been lingering in my mind from the day I read it and have been ever laughing secretly in my mind everytime I am reminded of an Anu aunty event of my life. It amazes me how we all have some Anu aunty characters in our life, but fail to notice them. 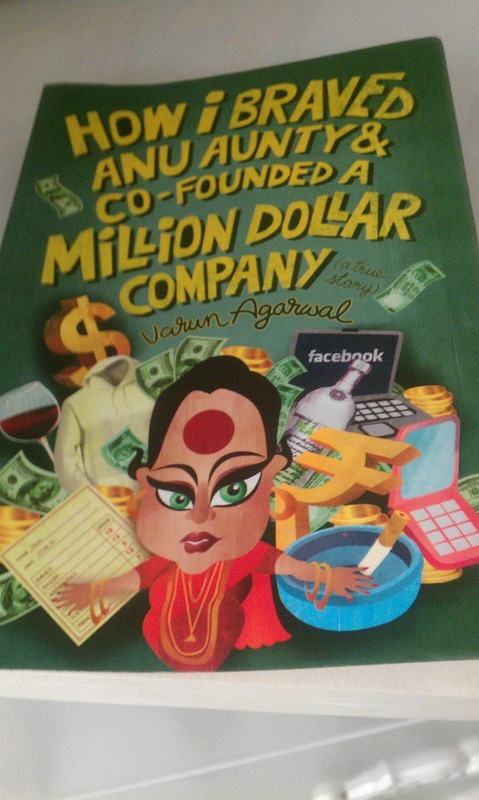 Well, if you do not have an idea about the Anu aunty character of this life, I seriously recommend that you go ahead and read this book. You will not regret reading this book. "Beta, kya fayda...do saal waste karo, aur phir package mein bhi jyada farak nahi". Yes, everything boils down to one thing. Anyways, this post is not to vent out my anger because I thoroughly enjoyed the conversation and I dedicate this post to all Anu auntys of India. BELIEFS, HALDI TILAK and MORE..
Beliefs are an integral part of human beings. One person’s belief might be a superstition or even a fad in another person’s views. But this does not stop the first person from believing in his beliefs. This often results in a continued quest between the two persons to turn the other one on his side. This objective may be accomplished through reasoning, debate, examples, demos or other means – like divine interventions. My father believes that relative positions of celestial bodies at our birth and their current positions hold immense power and information about our lives. In simpler words, he believes in astrology. With this belief stems another one. By incorporating small changes in your daily routine, you can though not change your future, but yes make it a bit more favorable towards you. My stand on astrology is very simple – No stand. Neither do I believe it nor do I not believe in it. ready to take up something I was not very comfortable with, I did not incorporate this. Some days later,news of possible job opportunities at a very good company came. This company was not in my wish list – it was much above that. It was a company I hadn’t dreamed of even in good times. This company was much more than my dreams. With no surprises, all students who hadn’t been placed applied for the company. I too did. Five students were to be finally referred to the company. I was amongst them. My spirits were so down, that I did not expect anything to come out of this. Numerous companies had shown hopes of job before this and this company was just too good to happen. It had been more than fifteen days, since the CVs were sent to the company and we were yet to hear from them. One morning while getting ready for college, I noticed the small glass bottle filled with turmeric powder and saffron strands, my mom had sent me. With no thoughts or reasoning, I did what my father had told me – I put a small, almost invisible tilak on my forehead. Till date, I do not know why did I take that step. "Life has its own reasons, of which, reason knows nothing"
That afternoon, as usual I came back to my hostel room to change my books for the next set of classes. I heard my mobile ringing. An unknown number flashed on the screen as my ringtone of “Quit playing games” continued ringing. I picked the call and a professional sounding person at the other end confirmed if it was me only speaking. As soon as I confirmed my identity, they introduced themselves. Their introduction shook the floor beneath my feet and sent me into a trance. The call was from the company for a telephonic interview!! They asked me if I was free and ready for the interview. Was I? The interview began and went on for ten minutes. They asked, I answered, we talked. The interview was over, but the affect on me was yet to be over. I quickly called my parents, placement officer and updated them on the latest development. I sat at the edge of my bed in an almost hypnotized state. The only thought that crossed my mind at this point was that wasn’t today the first day I had heeded to my father’s advice and almost a miracle has happened. Was this a mere coincidence or a divine intervention. This dilemma lingered in my mind for the next few days. I continued putting the turmeric tilak for some days, but somehow the routine got lost. It was again 2-3 weeks since the telephonic interview and they had not initiated talks of a second round. Did I not do well in the interview, or was my CV not impressive enough, or had the position been filled through some other candidate. Negative thoughts started penetrating my mind again. Next morning, I reopened the glass bottle containing turmeric, uttered a small prayer in my mind and applied the tilak. However, this time I did it with some better belief than last time. No news came that day. This did not stop me from applying the tilak next day. I did this with some belief (I admit, not full belief) for the next few days and the news came. They had called me for the next round of interviews. I flew to Delhi for the interview. The interviews and written tests went on for a whole day and I had only one thing in mind while answering questions – This is a Do or Die situation. All my efforts and my families’ prayers paid off when I got the call same evening, confirming my job – Yes, they had selected me for the job. Even today, the dilemma is fresh in my mind. Was it really a divine intervention triggered off by the turmeric tilak, which had turned the celestial bodies in my favor or was it a mere coincidence. Whatever, the truth be, it has altered my views permanently with respect to the impression of celestial bodies on our lives. Though, I am still a little uncomfortable when somebody tries to predict my future by looking at the lines in my hand, or by drawing tarot cards or by adding up the numbers in my birth date, I have started accepting the power of celestial bodies and I would be ever thankful to them for giving me something which I wanted the most – a job better than my dream job! Extra Two Hours - Do something special! Lata and Arjun, recently married, had shifted to US right after their marriage. Arjun had been sent to US by his employer (a big software company of India) to work for a client. Lata belonged to a small two tier Indian city. Though she was confident at the time of leaving India that her convent school education and her B.Com graduation has made her capable to adjust in a world class city like New York, she wasn't so sure now. Yes, she could converse in English with her neighbors and Arjun's colleagues and friends, but she did not understand these people. She did not understand their culture or their lifestyle. She couldn't bring herself to accept the level of freedom these people had. She had been married to Arjun in a typical Indian arranged marriage setting. Her parents had chosen Arjun for her. Whereas, it was the exact reverse here in US. People went out and found their life partners on their own. Lata was yet to completely understand her husband Arjun. He was a caring husband. He ensured that she was having a comfortable stay in US and in return, she was taking great care of him as well as his home. Yet, she often thought that they did not share the same thought process or the same passions. There was something so missing from their relationship. Then one day she discovered the Surf Excel Matic pack in her bag from India which her mother had filled with similar household items to ensure that she did not have to go hunt for these items in her very first few months of stay in US. She decided to try this new detergent for washing clothes the coming Sunday. Yes, here in US they did not wash clothes everyday like India. It was a weekly activity and Arjun helped her in it. Though she tried to persuade him in the first two weeks that she could do it herself, he insisted to help her and also told her that all the men did so in US. The very next Sunday, Lata showed the new detergent Surf Excel Matic to Arjun. To much of their surprise they realized that with this new detergent they did not need to spend time getting rid of stains on clothes. Surf Excel Matic took care of it all. They suddenly had some ample time at their hands. Arjun suggested that they go out and learn how to dance in this newly found extra time. Arjun was a good dancer, but Lata was very averse to dancing. Arjun wanted to prepare for the annual dance evening at his office to be organized two months from now. Lata suggested that they spend time on their home decor. In spite of Lata's efforts, their home still had the feel of a bachelor's home. There were bean bags instead of sofas, a gaming console in the living room instead of music player, a foosball table instead of a dining table and so on. They had their first fight. Both decided to use the time as per their wish. Next Sunday, Lata went out after putting the clothes in the washing machine. She did not know where she was going and then a thought came to her mind. This routine went on for quite some weeks. Lata would step out of the home after they had put the clothes in the washing machine and mysteriously Arjun would also wait for Lata to leave as if there was something up his sleeve. However, Lata was not concerned as there was a plan going on in her mind. It was two months now from the day of their first fight and Lata was eager to get back home from one of her mysterious trips outside home and break the surprise for Arjun. Yes, she had joined dance classes and was devotedly learning this new art to match Arjun's footsteps on the Annual dance night. Today was her final class and she was happy that she had done well. It was also just two days away from the annual dance night at Arjun's office. She walked the half mile distance to their home conjuring up ways in which she would tell Arjun this and also imagining his possible reactions. She could feel the excitement and happiness in the rhythm of her walk. She reached home and opened the door. All the images which she had conjured up over the way took a backseat as she was herself taken by surprise. Her home was completely refurbished. She saw a comfortable sofa with beige covers and turquoise cushions, a new mantelpiece and above all a beautiful dining table for four all set for dinner with two candles flaming in the middle and Arjun standing right beside the table. Arjun had been making all this furniture in their garage every Sunday with the extra two hours. Tears came to her eyes when she realized that Arjun too had been working all these days for her wish. She crossed the length of the room and hugged Arjun and told him what she had been doing all these Sundays with the extra two hours. Both of them laughed. Over candle-lit dinner that night as they laughed and talked about their respective secret projects, Lata realized that she had just attained that special something which was missing from their relationship - the wish to see each other happy. In a silent prayer she thanked Surf Excel Matic for it. I would give the time to my secret wish of writing fiction. The above story is my first attempt at fiction and I thank Surf Excel Matic for this. My extra two hours would be spent writing many more such stories and finally work towards the biggest wish of my life and that is to write a book. The above blog post is my submission for the #GetSmart contest at Indiblogger. The contest is powered by SURF EXCEL MATIC. If you like this post, please go ahead and vote for me by clicking on the picture below. You can vote using your Facebook or Twitter accouts too. This is my first book review on this blog, though I have been wanting to do this for some time. Fate, Fraud and a Friday Wedding written by Bhavna Rai (who is an ex-Adobean) was a book which captured my undivided attention after a long time. I love reading books and have been reading fiction since fourth standard. I started with Enid Blytons and reached Sidney Sheldons and Jeffery Archers. Since ever, I have followed the rule to not put down an unfinished book. However bore it may be I always make it a point to complete it if I have started it. So, the very first criterion, which I use to rate a book is did I have to finish the book because of my rule or was the book interesting enough to keep me glued to it. Fate, Fraud and a Friday Wedding faired excellently well on this judgement criterion. I had to make no effort to complete the book. Kudos to Bhavna Rai (author) for breaking the trend and not being another Chetan Bhagat inspired author. I seriously feel that almost everybody is fed up of reading college life descriptor, grammar less novels by newbie authors trying their hand at writing just because Chetan Bhagat struck gold. The novel starts off with multiple stories mushrooming in different parts of the world in varied scenarios and settings. As we move on in the novel, these stories subtly start crossing paths with each other and in the end unravel into a single story. It is indeed commendable the way this novel has been able to maintain the flow of each of these individual stories and then seamlessly transition them into each other. The storyline has a backdrop of the Indian IT & ITes industry and gives some great insights into its working. Every IT professional would surely find instances in the novel to which he may relate to easily. Much of the story takes place in Delhi and the easy dropping of names of Delhi joints (which only a true Delhihite would be aware of) makes the novel more realistic. It is interesting the way the novel's characters have been handpicked to depict real people and not just the type of people you would read about in books. The novel very beautifully gives you a view into the thought processes, states of mind of people trying to solve the unending tangle of career, passions, love and life changing events. I have always heard people saying that how they miss their childhood, college life, etc, etc. How they wish they could just return back to that life once more. Well, I have surely had my share of good moments (ok not good but great moments) in life and the ones closest to my heart are my engineering college days. Recently I got a chance to visit my college. This was after a span of more than three years since the college's last day. I was visiting family in a nearby city and the visit to the college was an instant plan. No surprises, that butterflies started flying in my stomach just at the thought of seeing the same campus to which I had bid adieu. Got up early in the morning, got dressed up in my favorite pair of Levis Jeans and a bright pink ZooZoo T-shirt. Yes, the colors and theme of my clothes clearly reflected my mood. To say it simply, I was overjoyed. The slight rhythm in my walk, a song on my lips, sparkle in my eyes and the persistent smile was saying it all. Well after an hour long drive throughout which my mind was just filled with nostalgic thoughts, I reached college. Yes, there it was. The building stood tall and strong with open doors and a long pathway which led to the main building. Everything was same and I could almost feel each and every atom of that place shouting out to me and saying that it recognize me the same way I recognize them. I walked down the same path which I had walked down infinite times before, avoiding the big tree in the middle of the path which was still there, stealing a glance towards the student's store to see if any friends were standing there, walking further ahead I came in view of the most cherished and also the most visited place during the college days - Coffee Corner. This was the place, I believe, I had never missed even on a single day during college, irrespective of the fact that I attended classes or not. I came to the turn which led to the Coffee Corner and the same dilemma crossed my mind, which had zipped through my mind about a zillion times before - To take the turn towards the Coffee Corner or not and continue ahead towards the classes. My heart took the same decision which it had taken a zillion times before - A quick coffee is only gonna give me better concentration in the classes (my mind reasoned) ;) . As I now walked towards the Coffee Corner, my mind actually conjured up the faces of all my friends right there. Oh yes, I could now clearly see all of them. Some of them were sitting on those black plastic chairs and red tables, bags hanging by the side, a cup of coffee in one hand and frenziedly copying away lab notebooks at the last minute with not even a remote idea of what was written. I could hear the plans of a movie going on in between the bites of paneer patties and knew that my plans to attend the day's classes were now over. Oh, did I just hear the sound of an Activa stopping right outside the Coffee Corner. I looked out and yes rest of my gang was there. Before I could wave to them, I heard a very familiar voice and somehow I felt that though close this was coming from a distant time altogether. I shook myself back from my fantasy land and came back to the present life. The voice belonged to none other than, but Raju Bhaiya of Coffee Corner. Yes he had too recognized me and I soon realized that he was not a face conjured up by my mind but he was there for real. He was quick to update me on the latest news he had about my batchmates. I treated my cousins (who had accompanied me on this enchanting trip) with the same cold coffee and patties which had been life saviours from the horrible hostel food. I took my coffee and went and stood at my favorite place on the steps of Coffee Corner from where one could see the entire college (well at least the entire boys hostel :) ) and stealingly wiped out the single tear which had found a way to escape my otherwise tightly shut eyes and had trickled down my face. Though only for a few moments I had relived my cherished memories.